Sound enhancements, sometimes called ‘audio enhancements’ are audio enhancement software packages designed to improve how your computer’s specific hardware sounds. Microsoft includes these enhancements in basically every computing device they ship out. Unfortunately, these sound enhancements cause problems when using Edison, often making your program fail when you try to download it to Edison. That’s why we strongly recommend disabling sound enhancements if you are using a Windows device to program Edison. What do sound enhancements do? You can think of sound enhancements as audio filtering software designed to soften and smooth out audio files for an easier listening experience. Windows machines usually come with either Microsoft’s own audio enhancements or include audio software from third-party vendors. This functionality is great if you are trying to create a more cinematic experience in terms of sound quality in a big surround-sound style sound system. Furthermore, these ‘enhancements’ are often the culprits behind a range of problems with audio and sound. As a general rule, you don’t need sound enhancements enabled on computer devices. But don’t worry- you can always reenable them if you want to later on. Why are sound enhancements a problem for Edison robots? You know the sound you can hear when you download a program to Edison? It sounds similar to an old dial-up modem starting up. It may not be all that pleasant to listen to, but it is very important – that sound is your program making its way into Edison! All of Edison’s programming languages are compiled by our online compilers and then sent as .WAV file to your computer. These .WAV files are then played by the computer to Edison through the EdComm cable, which is how the program downloads into Edison. Sound enhancement software uses its audio filtering to try to ‘smooth’ this sound out. This is a big problem for Edison because this ‘smoothing’ of the audio corrupts sections of the data and also causes Edison to miss other bits of information entirely. The result is Edison receiving an incomplete program and the program failing. Sound enhancements and Edison downloads just aren’t compatible! How do I disable sound enhancements? 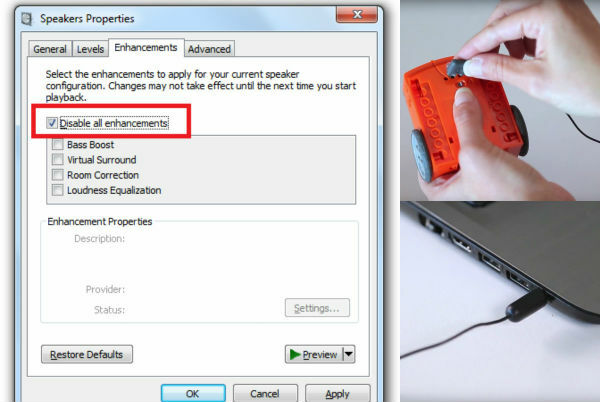 The steps you need to take to disable sound enhancements will vary depending on the type of software on your machine. On our website, you will find step-by-step video guides showing you how to disable sound enhancements for standard Window’s sound enhancements as well as the most common third-party software programs. Some of the third-party software can take a bit of effort to get disabled, but once you turn sound enhancements off once, you should be good to go from then on. If your school or organisation uses an image to control the network computers’ settings, we recommend you speak to your network administrator about having sound enhancements disabled on the image. If the image has the sound enhancements turned on by default, you will need to turn them off on each computer every time you want to use Edison. But if the image has sound enhancements disabled, then they will be turned off on all computers on the network – saving you a lot of time! Check out our troubleshooting page for more information about disabling sound enhancements. Does anyone know how to disable sound enhancements on Windows 10? 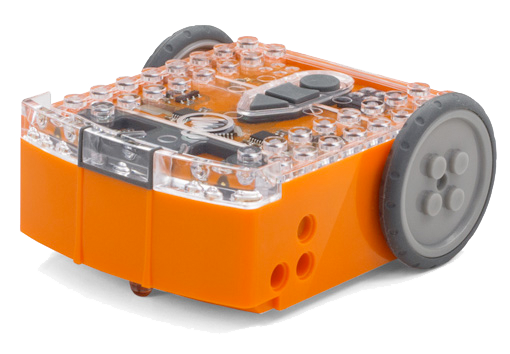 The video available at https://meetedison.com/edison-robot-support/trouble-shooting/#soundenhancements was made using a Windows 10 machine, so that should get you started. You may have third-party sound enhancements on your machine as well, so be sure to check out the step-by-step guidance on how to disable the 3rd party sound enhancements also available through that link. Does anyone know how to disable sound enhancements on an iMac? Apple computers, including iMac machines, do not have sound enhancements, so should not need this step. Some Macs do experience audio clipping errors when attempting to program Edison. Please try dropping your volume from 100% to between 50% and 90% instead. If you are having issues programming, please contact our customer technical support team at https://meetedison.com/edison-robot-support/contact-us/ and one of the friendly Support Officers will be able to help you out!